Our discussion at puppy class this week was all about the puppy crazies. You know, when the switch flips, and your normally sweet and wonderful pup turns into a wild, jumping, biting, running, out-of-control tornado. I totally understood why my students were both frustrated and worried. Is there something wrong with the pup? How do you stop it? How long will my puppy do this? Fortunately, there is nothing wrong with these pups. Not only are the puppy crazies normal, but you are not alone—most puppies get the puppy crazies–sometimes several times a day. 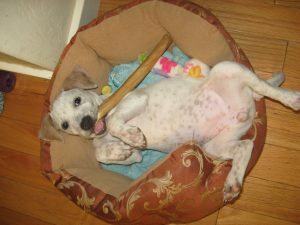 Puppy crazies seem to be worse in the morning and evening, and sometimes after pups are left alone for longer periods. Of course that doesn’t make them any easier to live with and handling the puppy crazies in an appropriate manner now will make a difference later on. So what do you do? Give your pup part of her dinner. Then take her outside to run around and potty. Bring her back in and give her the remainder of her dinner in a Kong or other food-dispensing toy in her crate. Make it yummy (add a little peanut butter or cheese to the kibble) to keep her attention and make sure the crate is near you so she isn’t isolated. As she chews and eats, she will likely settle down and soon fall asleep. Open the back door (assuming you have a backyard) and let your pup zoom around the yard and run it out for a few minutes. Try to focus your pup on a toy or chew. Wait it out. The crazies are usually over in 5 minutes or less. Yell at or chase your pup around. This may actually make them more hyped up. Try to restrain your pup. The pup may direct the puppy crazies towards you. Most of the time prevention and management are the best bet with the puppy crazies. And don’t worry. As with many puppy challenges, this too shall pass. Do you have other ideas on how to handle the puppy crazies? I’d love to hear about them.